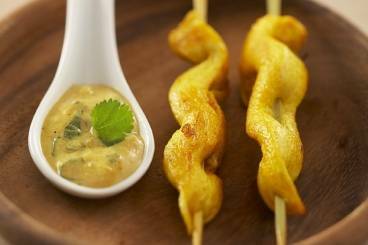 Chicken skewers marinated in ginger, lemongrass and turmeric served with a satay sauce. Cut the chicken lengthways in to strips. Prepare the marinade: peel and dice the ginger in to small brunoise. In a bowl, mix half of the chopped ginger, sunflower oil, turmeric, sugar and the finely chopped lemongrass. Place the chicken strips on to skewers and brush with the marinade. Leave to marinate for 20 minutes. Place the rest of the chopped ginger in a saucepan and add the coconut milk, chilli paste and the peanut butter. Bring to the boil and then add the freshly chopped coriander to finish. Cook the chicken skewers on a griddle or in a hot frying pan with a little oil. Serve with the satay sauce and enjoy immediately.